Grain-free never tasted better! 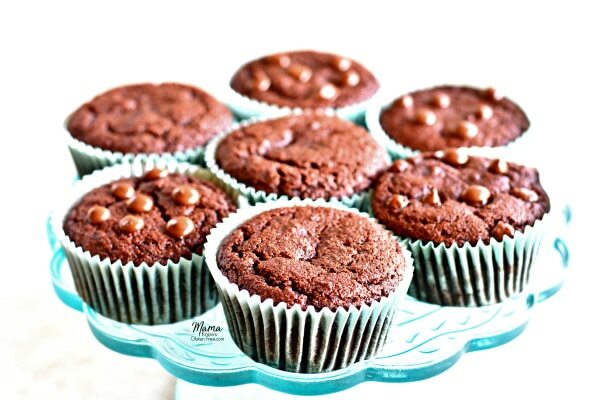 These easy and super moist Paleo chocolate muffins will satisfy your chocolate cake cravings. Made with simple and healthy ingredients. Gluten-free, dairy-free, grain-free and no refined sugar. I have been doing a lot of grain-free baking because my husband and I have been eating more Paleo to help with his migraines and autoimmune inflammation and my thyroid and adrenal issues. Paleo simply means gluten-free, grain-free, dairy-free and no refined sugar. Paleo muffins are a favorite of my family. I have been baking a lot of Paleo muffins in a variety of flavor combinations because they are my husband’s go to for breakfast, snacks, and dessert. Seriously, I am baking Paleo muffins every other day. My husband and my kids love them and eat them so quickly that they usually don’t last but one day. I love how easy they are to make and that they are a healthier version of your traditional gluten-free muffin. They are made with simple and healthy ingredients like almond flour, no sugar added applesauce and honey. 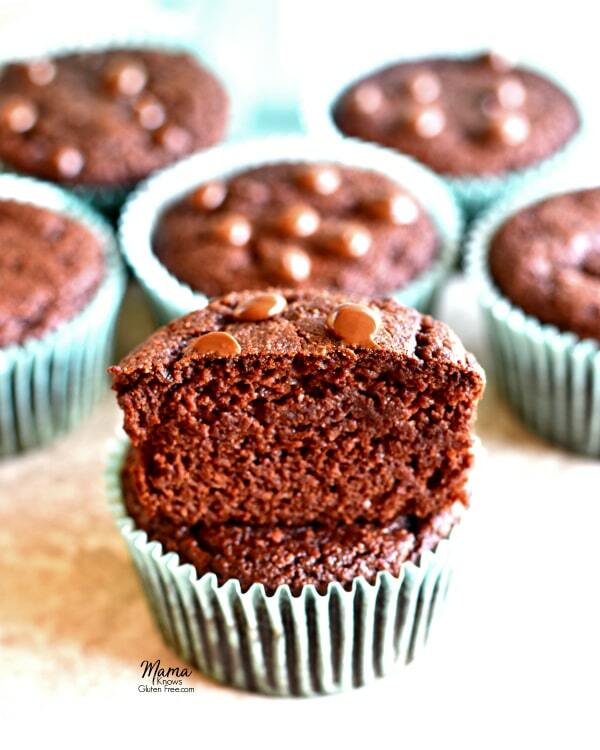 These Paleo chocolate muffins are super easy to make. They are a one-bowl wonder that can be made in less than 40 minutes. They are moist and chocolatey. 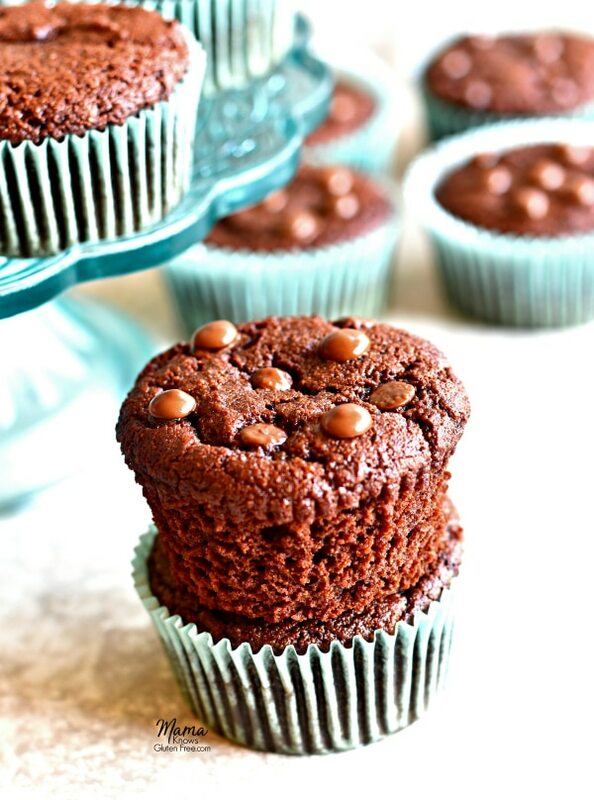 I don’t feel guilty about eating more than just one of these healthy Paleo chocolate muffins. I hope you enjoy them as much as my family and I do. Also, check out my other Paleo muffin recipes. 1 cup unsweetened applesauce I buy the snack sizes they are 1/2 cup servings and keep them in my pantry for baking. In a large bowl add the wet ingredients first (eggs, applesauce, pure vanilla extract, pure almond extract and honey) and stir tother until fully combined. Then add the dry ingredients (almond flour, baking soda, gluten-free baking powder, salt, cinnamon and cocoa powder). Mix until fully combined. Bake for 23-26 minutes. Please watch your oven because all ovens are different. Add chocolate chips to the top of hot muffins (optional). 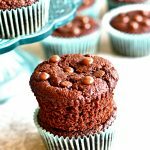 I had to try these as I love chocolate chocolate chip muffins and as much as I love your bread these seemed a given. They did not disappoint! They are fabulous! A lot of Paleo muffins are dry or just not tasty and these were moist and tasted just as good as the regular version. Now I can have them as a treat and not feel guilty. I will definitely be trying more of your other muffins etc. Thank you so much for the wonderful 5-star review Judy! You just made my night! I make Paleo muffins for my husband several times a week and I know how important it is to make sure they taste good. I am so happy that you enjoyed them and I hope you enjoy other recipes you try on the blog. My husband’s favorite flavor is the honey vanilla ones I make him. Sounds like I need to get them up on the blog too. Thanks again for the wonderful review. My heart is very happy and I have a huge smile on my face! I would love to see the recipe for the honey vanilla muffins too! Sounds delicious. I’m eyeing some more of your recipes to try very soon too. Just made these chocolate muffins. I cut the recipe in half just in case something went wrong. Well, it didn’t! These are delicious……..very moist. They won’t be around very long! This is the first Paleo recipe I’ve ever tried. I’m thrilled with the outcome. Thanks once again, Audrey! Thank you so much Susan for the lovely 5-star review! It makes my heart so happy when I hear that others are enjoying my recipes. You are so welcome, I love sharing what I make for my family. Are these the little or big muffin tins? Hi Pam! I made these muffins in a regular muffin pan, but you could use a mini muffin pan also. When I saw this recipe posted on FB, I sent my boyfriend to the store for a couple of ingredients that I needed because I had to make these muffins. I was not disappointed. This is by far the best chocolate muffin recipe I’ve ever tried. Thank you for giving me a nice chocolate fix! They aren’t overly sweet, which was a nice surprise. They are also very moist, which was also a surprise because I don’t always have the best of luck with muffins. I’m new to gluten free and I am still getting used to almond flour but I will say, you cannot tell that anything other than regular flour is used in this recipe. This will definitely be added to my favorites and I look forward to trying more of Mama Knows Gluten Free recipes. 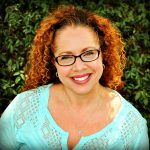 Thank you so much Tracy for the wonderful 5-star recipe review! It makes my heart so happy to hear that you enjoyed the chocolate muffins. They are definitely one of my favorites. Almond flour can be tricky to bake with for sure. Let me know if I can help in any way. I hope you enjoy any of the other recipes of mine that you might try. Thanks again! Can I substitute coconut oil for applesauce? I dont have any applesauce on hand! Hi Lizard! I have never tired anything other than the applesauce. If you try it with the oil, please let me know how it turns out. I hoep you enjoy the muffins! Great recipe! I made these tonight after a chocolate craving hit (I’m 6 months pregnant), and wanted to feel good about my dessert. These were so easy, I love the one bowl mixing. Oh, and I subbed regular, full fat yogurt for the applesauce (1cup) as I didn’t have any applesauce, and added chocolate chips. Worked like a charm! Super moist, chocolatey but not too sweet. Thank you!! Thank you so much for the wonderful 5-star recipe review! I am so happy to hear that you enjoyed the muffins. I am glad to hear that the yogurt worked in place of the apple sauce. Congratulations on your baby! Thank you again! Hi! I am looking forward to trying these when I have people over later this month. It would be great to be able to make these in advance. Do you know if they be frozen? Thanks so much! I can’t wait to try them!! Hi Fran! I have never frozen them before. When I make them they never last longer than 24 hours with my family. If you decide to try freezing them can you please let me know how they turn out? I hope you enjoy the muffins!